Plumber & HVAC Essex County & Cedar Grove | MarGo Plumbing Heating Cooling Inc.
We're always open. Give us a call... Whenever you need a repair. MarGo Plumbing Heating Cooling Inc. was founded in 1998 because we saw a local need for quality customer service in the plumbing and HVAC fields for the Essex County area. Homeowners need to know that they can receive rapid service from outstanding technicians whenever they have issues with their home plumbing, heating, or cooling, and we strive to supply that level of reliability and service every time. We always answer our phones, and most jobs can be booked the same day. Our trucks will arrive at your home fully stocked to handle almost any situations. No matter what work you need done, we’ll see that you have a comprehensive solution, not merely a band-air or a temporary measure. We offer a complete range of residential services in Cedar Grove, NJ and throughout Essex County, Bergen County, and Morris County. Call us when you want service today! You use the plumbing in your home every day for a variety of purposes, often in ways that you don’t even think about. But when something goes wrong with the plumbing, you’ll definitely notice the negative effect it has on your daily life! You can always reach our skilled, licensed plumbers to schedule the service to take care of problems like clogged drains, a broken garbage disposal, pipe leak repairs, or anything else. In addition to fixing plumbing problems, we also handle new plumbing installations, such as sump pumps, tankless water heaters, and new piping. Talk to us today to find out more about our extensive plumbing services. Residential plumbing consists of two sections: the freshwater side that brings water into the home and to the taps and appliances, and the wastewater side that cleanly and hygienically removes wastewater and solid waste out to the sewer system. Seeing that your drains and sewer line remain in the best shape so you won’t have to worry about them is a key part of our job. We handle such important services as drain cleaning (using the best in current hydro-jetting technology), video pipe inspections, and complete sewer line replacements. Don’t hesitate to call us whenever you believe that your drains and sewer line are in trouble. The quality of the water that enters homes has become a major concern for more and more people. Do you know what’s in the water that you and your family drink and use to shower and clean with? If you think there’s a reason to be worried, or if you simply wish to take special precautions, schedule water testing with us. We’ll then determine what type of whole-house water treatment system will give you the purest water possible. We install a variety of different treatment systems to help clean your water, such as UV water purifiers, water softeners, and water filtration systems. Maintaining a warm home during a New Jersey winter is something that takes the assistance of experienced HVAC professionals. Our team of heating experts will see that you have the right heater, working in prime condition, to keep your household safe and comfortable through the winter months. We install many types of heaters, such as furnaces, boilers, radiant heating systems, ductless mini splits, and heat pumps. Whenever you need fast repairs, we’re standing by to arrange for same-day service so that you won’t have to suffer in the cold for long. No matter the job we do, we’ll go through it with you so you’re informed every step of the way. Every one of our employees is committed to seeing that you’re satisfied with the work we do. That’s why you should call us when you’re searching for the best and most energy-efficient way to keep your house cooled down during the summer. Are you searching for a new air conditioner for your home, or is it time to replace your old AC with a high-efficiency new model? Is your current air conditioner in need of quick repairs to get it working once more? Or are you ready to arrange for regular spring maintenance to prep your cooling system for summer? We handle all of these jobs with professionalism and a high level of craftsmanship. There’s another way that we can help improve your home comfort. We provide indoor air quality services to remove unwanted particles and other pollutants from circulating through your home. This includes installing air filters in the HVAC system, pairing them up with air purifiers, and installing humidifiers to deal with the dry air during parts of the year. You can trust to our customer service-focused team of professionals to see that you receive only the best when it comes to indoor air quality. 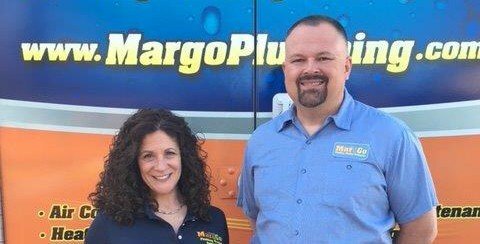 Call MarGo Plumbing Heating Cooling Inc. today and find out why so many other homeowners have picked us for their comfort services. Our Mission is to give customers The best Quality and most pleasant experience in dealing with a plumbing, heating, air conditioning company.